Taylor Waldon is the Content Writer for GiveWP, a WordPress donation plugin dedicated to democratizing generosity, and WP Business Reviews, the new WordPress Reviews plugin. She has a passion for WordPress and over 8 years of professional experience in marketing, website content management, and writing and editing. In a world where business is done mostly online, it’s no wonder that review marketing has become increasingly in demand. This demand was felt within the WordPress space and WP Business Reviews was created to rise to the challenge. Why Put Reviews On A Website? In recent years, reviews have risen in importance for search engine optimization and general marketing strategies. Reviews are the new word of mouth. So the easier they are to find, the better it is for business. Reviews are the new word of mouth. So the easier they are to find, the better it is for business. Including positive reviews filled with keyword rich, user-generated testimonials on a website do more than just lead customers to the social proof they need to decide to use a business. It also provides search engines with more authoritative content when it searches through the website. In an effort to give marketers and business owners everywhere a simple solution to display their best reviews from a variety of platforms, WP Business Reviews was created. This article will walk through how to use WP Business Reviews and explain all of its available features. What Is WP Business Reviews? 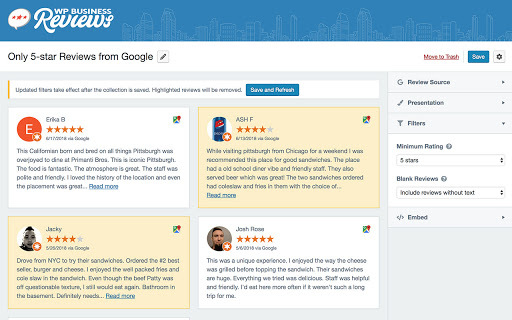 The makers of GiveWP, the Impress.org team, developed WP Business Reviews to allow users to display their reviews from multiple platforms, like Google, Facebook, Yelp, and Yellow Pages, right on their websites. The reviews can be styled in a variety of ways and will look great with any theme. In order to get WP Business Reviews, visit the WP Business Reviews website and purchase the plugin. It’s well worth the power to take control of online reviews. After purchasing a license, download the plugin and install it on a WordPress website just the same as any other plugin. Go to the license tab of the Reviews settings and activate WP Business Reviews using the license key. Once WP Business Reviews is installed and activated, the first thing to do is connect the necessary review platforms. To do this, an API key is needed from each platform. There is a “Help” screen embedded in the plugin for those who need assistance in setting up their WP Business Reviews plugin. Google, Facebook, Yelp, and Yellow Pages all have different methods of obtaining an API key, but each is well-documented throughout the plugin and website. There are also videos under the “Help” tab within the plugin that walk users through this process. All that’s left to do is start pulling in reviews and decide how to showcase them. It’s best to get started with collections, pulling in multiple reviews from reputable review platforms at one time. It’s possible to add single reviews later if the user wasn’t satisfied with what was allowed through the API. Reviews can be styled in a multitude of ways to match your needs and website design. 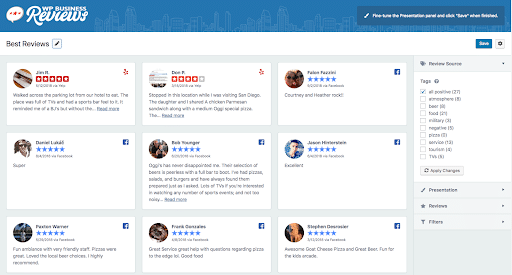 Facebook, or Yelp by searching for a specific business and clicking “Get Reviews.” The reviews will be populated and the user can style and filter each collection to suit their needs. Included is a filtering feature, which gives full control over what reviews are shown and which components are included. Users can choose to have only reviews with 5 stars and above or allow customer experiences to speak for themselves in their standard format. The choice is there. If reviews are filtered out in a platform collection, they can be found later on in the single reviews list. All of the reviews pulled into a collection through the platform’s API will also be saved as a single review. Filter settings allow users to control the reviews shown in collections. Light, dark or transparent color styles. Autofit or number of columns. Line breaks enabled or disabled. Choose reviewer components to display. Choose a minimum rating to display. Filter out reviews without text. Collections aren’t the only way to input reviews into the system. Users can also manually enter single reviews. These are added as a “custom” review without a chosen platform or may be attributed to the Google, Facebook, Yelp, and Yellow Pages platforms. All of the reviews pulled into collections are also added to the single reviews list to configure the details of each review individually. 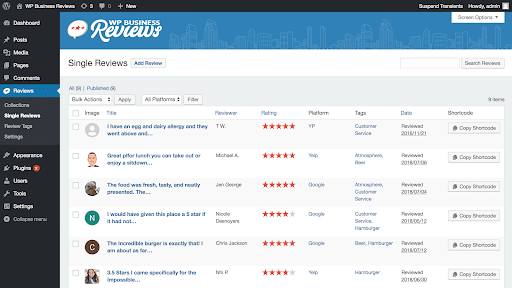 The single reviews page is where a user edits, deletes, or adds tags to single reviews. Single reviews can be displayed with their individual shortcodes anywhere on a WordPress website. If, for example, a restaurant owner wants to display her best cheeseburger review right on the menu page, she can do exactly that. In addition to shortcodes, reviews can be embedded as widgets and eventually as blocks within the new WordPress editor, Gutenberg. Single reviews can be added to Google, Facebook, Yelp, and Yellow Pages and custom collections. They can also be sorted using tags. When tags are added to single reviews, it allows the user to create a tagged collection from the collections screen. Tagged collections are created by selecting a specific tag or multiple tags together. The resulting collection contains reviews that are related by topic or purpose rather than platform alone. Tags can help you display your reviews in creative ways. Sort them by subject or simply mashup all of your best reviews. Tagged collections are a great way to sort out reviews by subject and target specific keywords on your website. They can also help to identify areas of immense strength for a business as well as point out ways a business can improve. 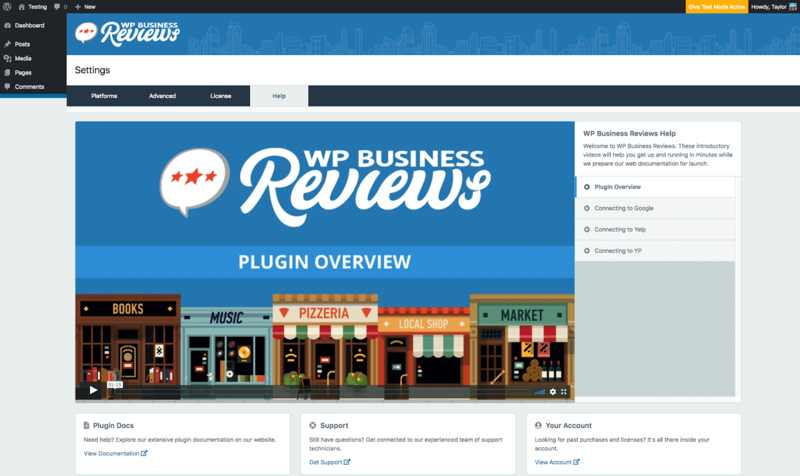 WP Business Reviews is brand new. The plugin is already robust in its infancy, but the team plans on adding more platforms and features down the line. Google, Facebook, Yelp, and Yellow Pages reviews are just the start of what this powerful plugin will achieve. As WP Business Reviews grows, the potential to help you boost your review marketing efforts will also. Reviews are social proof, and including them on your website is just another way to give both Google and potential customers a reason to trust your business more. Try WP Business Reviews now as a small local business, a marketing agency, or as a blogger. The applications are endless. The license is $99 for one year for a single site or $149 for 5 sites, with bulk pricing also available.